[S6] G.E. Cokayne; with Vicary Gibbs, H.A. Doubleday, Geoffrey H. White, Duncan Warrand and Lord Howard de Walden, editors, The Complete Peerage of England, Scotland, Ireland, Great Britain and the United Kingdom, Extant, Extinct or Dormant, new ed., 13 volumes in 14 (1910-1959; reprint in 6 volumes, Gloucester, U.K.: Alan Sutton Publishing, 2000), volume II, page 464. Hereinafter cited as The Complete Peerage. After her marriage, Adele Neri was styled as Countess Cadogan on 12 January 1911. From 12 January 1911, her married name became Cadogan. 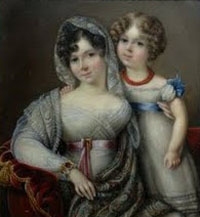 unknown daughter Drax is the daughter of Henry Drax and Elizabeth Ernle.1,2 She married James Waldegrave, 2nd Earl Waldegrave, son of James Waldegrave, 1st Earl Waldegrave and Mary Webb, circa December 1754. John Waldegrave, 3rd Earl Waldegrave was born on 28 April 1718. He was the son of James Waldegrave, 1st Earl Waldegrave and Mary Webb. He married Lady Elizabeth Leveson-Gower, daughter of John Leveson-Gower, 1st Earl Gower and Lady Evelyn Pierrepont, on 7 May 1751.1 He died on 22 October 1784 at age 66. He gained the title of 3rd Earl Waldegrave. He gained the title of 1st Earl of Upper Ossory. George Waldegrave, 5th Earl Waldegrave was born on 13 July 1784. He was the son of George Waldegrave, 4th Earl Waldegrave and Lady Elizabeth Laura Waldegrave. He died on 29 June 1794 at age 9 at Eton College, Windsor, Berkshire, EnglandG, accidentally drowned in the Thames. He gained the title of 5th Earl Waldegrave. He gained the title of 6th Earl Waldegrave. Edward William Waldegrave was born on 29 August 1787. He was the son of George Waldegrave, 4th Earl Waldegrave and Lady Elizabeth Laura Waldegrave. He died on 22 January 1809 at age 21, drowned at sea on his return from Spain.